General Franklin Augustus Hart, a veteran of more than thirty-seven years of Marine Corps service, died June 22, 1967 at the U.S. Naval Hospital, Bethesda, Maryland. His varied and colorful career included service during the two World Wars, sea duty aboard several ships of the Navy, and tours in Haiti, Nicaragua, and the Dominican Republic. During World War II, General Hart won the Navy Cross while commanding the 24th Marines in the assault and capture of Roi-Namur Island, Kwajalein Atoll, and was awarded the Legion of Merit while leading the Regiment in the battles for Saipan and Tinian in the Marianas Islands. As Assistant Division Commander, Fourth Marine Division, during the assault at Iwo Jima, he was awarded the Bronze Star Medal. His citation for the Navy Cross reads in part, "Landing when the assault troops had advanced only one hundred yards from the beach, Colonel Hart fearlessly led his combat team against heavy enemy resistance in a crushing attack toward its first objective. " After repelling numerous counter attacks during the night, he skillfully reorganized his depleted units and affected a coordinated assault the next morning, rapidly overcoming all remaining opposition, and exterminating a large force of determined and fanatical Japanese. "By his valiant performance of duty and outstanding leadership throughout this perilous assignment, Colonel Hart inspired all with whom he served." The General was born on September 16, 1894, at Cuthbert, Georgia, and is a native resident of Eufaula, Alabama. He attended Alabama Polytechnic Institute, graduating in the class of 1915. Actively participating in sports at Auburn, he was a member of the varsity football teams of 1911-14, and for the same period a member of the varsity track and soccer teams. On April 6, 1917, he was appointed a Second Lieutenant in the Marine Corps, and four months later was appointed to the rank of First Lieutenant. After completing a course of instruction at the Marine Officers School, Norfolk, Virginia, he was ordered to sea duty as Commanding Officer of the Marine Detachment aboard the USS Vermont. He was promoted to the rank of Captain in October, 1917. In September of the following year he was transferred from sea duty, and in October sailed for France as Commanding Officer, Company "B", Machine Gun Battalion, Fifth Brigade. He returned to the United States in July, 1919, and was assigned to the Marine Barracks, Quantico, Virginia. Two months later, the General was again ordered to foreign shore duty, this time to the Dominican Republic where he was assigned duty with the Guardia Nacional Dominicans, as District Commander of Santo Domingo City (now Trujillo City). He returned to the United States in 1921, and in December of that year was assigned as Commanding Officer, 77th Machine Gun Company, Second Battalion, 5th Marines, at Marine Barracks, Quantico, Virginia. In October of the following year he was transferred to the Marine Barracks, Washington, D.C., where he served as adjutant and other related duties. In October, 1923, he was assigned to the Army Infantry School, Fort Benning, Georgia, as a student. Graduating in May of the following year, he was ordered to the Marine Barracks, Philadelphia, where he became an instructor at the Marine Corps Basic School. His second tour of sea duty came in June, 1926, when he took command of the Marine Detachment aboard the USS Seattle. In January, 1927, he assumed command of the Detachment aboard the USS Rochester, and the following month, was assigned similar duties aboard the USS Milwaukee. The Detachment served ashore with a landing force in Nicaragua for the next five months. From June, 1927, until July of the following year, the General again commanded the Marine Detachment aboard the USS Rochester. During the latter six months of this tour, he again served ashore in Nicaragua. General Hart returned to the United States in August, 1928, and in the following two years was stationed successively at the Marine Barracks, Norfolk, as Executive Officer, and the Marine Barracks, Quantico. At the latter post, he served as an instructor at the Company Officers Course, Marine Corps Schools. He returned to foreign shore duty in August, 1930, and joined the Constabulary Detachment, Garde d'Haiti, Gonsaieves, Haiti, where he served as a company commander and district commander. In May, 1933, he was named Assistant Chief of Staff, Garde d'Haiti, Headquarters, Port-au-Prince, Haiti. Returning to the United States in July, 1934, he was assigned to the Senior Course, Marine Corps Schools, Quantico, as a student. He was promoted to the rank of major as of May 29, 1934, and successfully completed the Senior Course in May, 1935. In June, 1935, he reported to duty at Headquarters, Marine Corps, Washington, D.C., where he performed duties in the War Plans Section, Division of Operations and Training. He was appointed a lieutenant colonel, in July, 1936, and in October, 1937, he became Officer in Charge, War Plans Section. General Hart's next assignment was to the Army War College, Washington, D.C. Graduating in June, 1939, he was ordered to the Marine Corps Base, San Diego, California, where he became Chief of the Planning Section. In July, 1940, he was named Commanding Officer, First Battalion, Eighth Marines, Second Marine Division. He went to England in June, 1941, where he was attached to the American Embassy in London as Assistant Naval Attache. In September of the same year, he assumed duties as Special Naval Observer and additional duty on the staff of the Chief, Combined Operations (British) as an instructor in amphibious warfare, and was appointed to the rank of colonel in December, 1941. He participated in the Dieppe Operation, July, 1942, for which he was specially commended for outstanding conduct by Lord Louis Mountbatten, Chief of Combined Operations. He remained in England until October, 1942, when he returned to the United States to become a member of the Staff of the Commander-in-chief, U.S. Fleet, Navy Department, Washington, D.C., as Chief, Future Plans Section. In June, 1943, General Hart was ordered to the Fourth Marine Division where he assumed command of the Twenty-Fourth Marine Regiment. During the following year he led the Regiment in the attack on Roi-Namur, Kwajalein Atoll, Marshall Islands, where he was awarded the Navy Cross, and the assault of Saipan and Tinian, Marianas Islands, where he was awarded the Legion of Merit. Appointed a Brigadier General in August, 1944, he served as Assistant Division Commander of the Fourth Marine Division, until late 1945, and in this capacity participated in the battle for Iwo Jima, where he was awarded the Bronze Star Medal. He returned to the United States in September, 1945, and assumed duties as Director, Division of Reserve, Headquarters, Marine Corps, Washington, D.C. In January, 1946, he became Director, Division of Public Information and in July, Director of Personnel. In October, 1946, he went to the Marine Corps Recruit Depot, Parris Island, South Carolina, as Commanding General of the Post. Appointed a Major General in December, 1946, the General remained at that post until assigned duties as Commanding General of the Second Marine Division, with additional duties as Commanding General, Marine Barracks, Camp Lejeune, North Carolina on January 31, 1948. 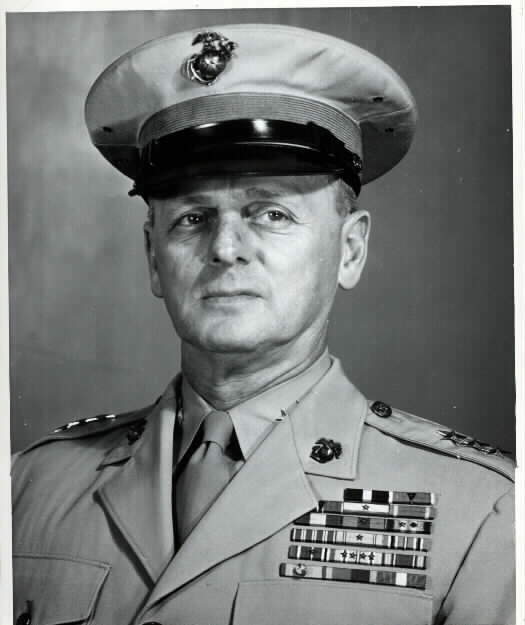 He was named Commandant of the Marine Corps Schools at Quantico, Virginia, in July, 1950, and was promoted to the rank of lieutenant general in February of the following year. He became Commanding General, Fleet Marine Force, Pacific, in January, 1952. He retired in August 1954 after 37 years of Marine Corps service and was advanced to the rank of general. In addition to the Navy Cross, the Legion of Merit and the Bronze Star Medal, his medals and decorations include the Presidential Unit Citation with one Bronze Star, Saipan-Tinian 1944; Navy Unit Commendation, Iwo Jima 1945; Mexican Border Service, 1916; Victory Medal with Atlantic Fleet Clasp and Maltese Cross, 1917-18; Marine Corps Expeditionary Medal with two Bronze Stars, Dominican Republic, 1919-21; Nicaragua, 1927; Haiti 1930-34; Second Nicaragua Campaign Medal, 1927-28; American Defense Service Medal with one Bronze Star; American Campaign Medal; European-African-Middle Eastern Campaign Medal with one Bronze Star; Asiatic-Pacific Campaign Medal with three Bronze Stars; Haitian Diploma for the Order of Honor and Merit; Haitian Distinguished Service Medal with Diploma; and the Haitian Brevet of Merit with Diploma. For extraordinary heroism as Commanding Officer of the Regimental Combat Team Twenty-Four, Fourth Marine Division, in action against enemy Japanese forces during the attack on Roi-Namur Island, Kwajalein Atoll, 1 and 2 February 1944. Landing when the assault troops had advanced only one hundred yards from the beach, Colonel Hart fearlessly led his combat team against heavy enemy resistance in a crushing attack toward its first objective. After repelling numerous counterattacks during the night, he skillfully reorganized his depleted units and effected a coordinated assault the next morning, rapidly overcoming all remaining opposition and exterminating a large force of determined and fanatical Japanese. By his valiant performance of duty and outstanding leadership throughout this perilous assignment, Colonel Hart inspired all with whom he served and upheld the highest traditions of the United States Naval Service.